Which countries drink the most alcohol? The biggest drinkers in developed economies are in Europe, according to the Organisation for Economic Cooperation and Development (OECD). 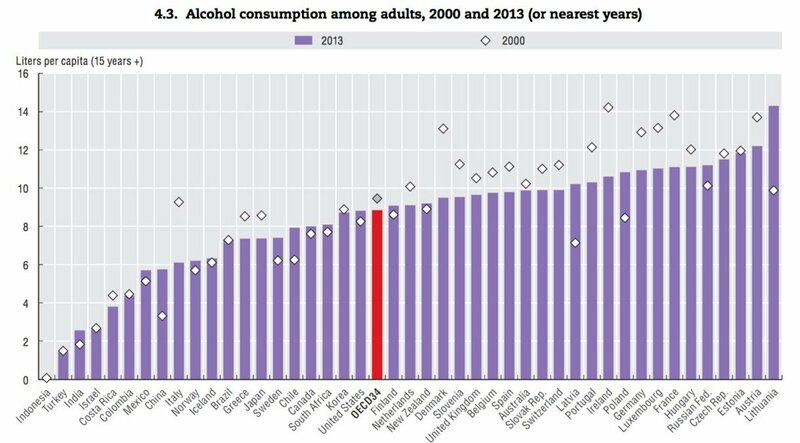 Lithuania was the largest consumer among the 34 OECD nations, with adults imbibing an average 14 litres of alcohol a year. Austria, Estonia and the Czech Republic were close behind. Cultural and economic factors play a big part in the rankings. Generally, alcohol consumption rises with the living standard of an economy. In addition, countries with the highest consumption tend to have strong traditions of drinking. More abstemious nations, such as Indonesia, Turkey, India and Israel, tend to have religious or other cultural norms that limit drinking. The OECD report warned nevertheless that hazardous drinking and heavy periodic drinking are on the rise, especially in women and young people. World Health Organisation data shows that alcohol accounts for nearly 6% of global deaths.